I want to attach a secondary suspension system to my underquilt, however I am not entirely sure how to setup/create the end part of it. With that I don't mean the part closest to the hammock with the line locks, but the other part. Do you add a seperate line to the four corners and at the end of those lines create a little loop so you can attach it to a carabiner together with the main suspension? Or do you create one line for the footend and one for the head end and have those ends attached to the linelocks? I looked at a couple of video's but it wasn't clear. Anyone have any information about and detailed pictures of this? I keep learning and will never know enough. How I do it: attach a short piece of 3/32 shock cord to each of the quilt 4 corners (you may have to sew on a piece of grograin to attach them to, if there is no attachment point), I then put a prussic loop on the main suspension cord on each of the corners (the loop can be from most any type of small cord, and needs to be large enough to make a larks head loop in it), I make a simple overhand knot in the end of the shock cord piece, next I make a larkshead loop in the cord and insert the knotted piece through it. You can then adjust the secondary cord back and forth along the main suspension. I sew a LineLoc 3 mounted on grosgrain ribbon to each of the four corners, but I run a separate length of shock cord between them that loops all the way out to the gathered end of the hammock, connected through the same micro-biner that fixes the primary suspension, rather than hooking a Prusik knot to the primary shock cord. See one way at 2:55 in video below. Shock cord prussik knot onto primary suspension. Hope that gives some insight. I'm building my first UQ and I think I'm gonna use this method. I really like it. 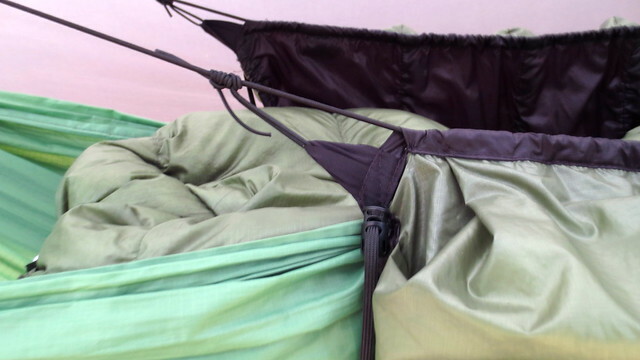 Question though, I'm adding pack hooks to my hammock like dream hammock. Will it matter which stretch of the line I run through the pack hook? I would say the primary suspension as it holds the UQ up. Thanks guys. I am first going to try to prussik it to the main suspension. If that doesn't work the way I want it to I can always go for the u shaped loop or even four separate lines for each corner. I am liking the simplicity of this.. I have a CDT UQ I have been mucking around with for the warmer weather.. no differential baffles or anything fancy, just a plain CDT UQ. The suspension is looking really messy and complicated and frankly, for the warm weather, when I might not need an UQ at all, the jumble of shock cord is annoying me. I like the idea of clipping to the ridgeline, but with an integrated bug net, that option goes out the window. I have Dutch's UQ suspension doodad's but haven't used them yet. Help me understand why you put the knot in the primary.. What happens if you don't have that knot in place? 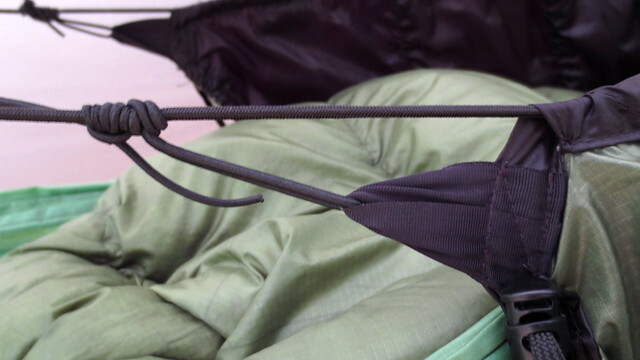 The knot stops the underquilt moving along the primary when you tighten/loosen the secondary. I only use linelocs at the head end (where they are easy to reach). This means that when I tighten the secondary, the UQ moves towards the head end, but to re-centre it I can just grab the sides and slide it down the primary lines. The one possible advantage of linelocs at both ends is that you can (theoretically) pull the UQ into a parallelogram, four better coverage. In practice, I've found that doesn't make a heap of difference.